Dr. Kevin Horan is officially a Roadrunner. 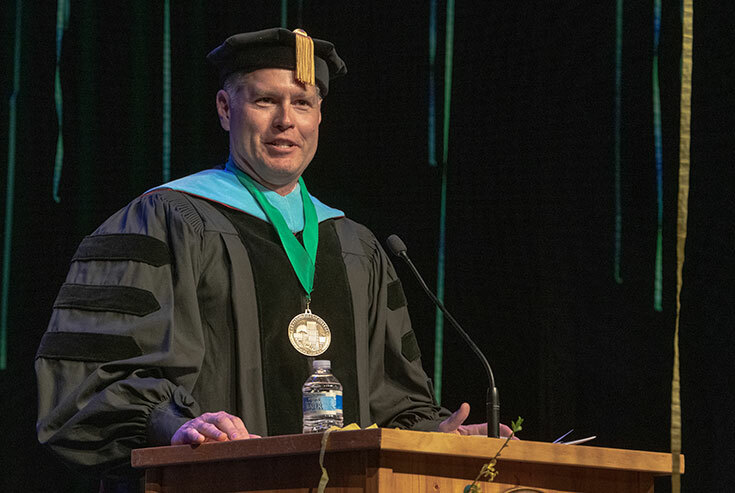 Crafton Hills College installed the longtime educator as its ninth president on Friday, Feb. 1, during an Investiture Ceremony held in the Finkelstein Performing Arts Center. Community leaders, educators and students from across San Bernardino County attended the event, which included remarks by officials from neighboring institutions, including Cal State San Bernardino and the Yucaipa-Calimesa Joint Unified School District. YCJUSD Superintendent Cali Binks pulled inspiration from Fred Rogers in welcoming Horan and his family to the “neighborhood” and spoke on the importance of partnership between Crafton and K-12 sites in the region. Helen Benjamin, retried chancellor of the Contra Costa Community College District where Horan was previously employed, agreed with Rodriguez’s sentiments adding Horan is ready for what lies ahead. “Your mission statement as stated online is to ‘advance the educational, career and personal success of a diverse campus community through engagement and learning.’ This mission is perfectly suited for Dr. Horan who has proven his commitment to engagement and learning and the jobs he has held,” she said. As Horan walked up to the podium to deliver his remarks, his wife Erica captured highlights on a smartphone, while his two children – Sage and Reid – parents, in-laws and older brother beamed with pride. Horan spoke about his excitement for Crafton’s future and reflected a bit on his own struggles as a community college student with a low-grade point average and uncertainty of the future. Although he felt like a “failure” this experience “laid the groundwork” for him to discover his path and passion for student development and eventually Horan “found his way” to give back to the community college system that helped him, he said. Prior to his appointment at Crafton, Horan built a name for himself in education through his work in student services with the Contra Costa Community College District, most recently as the vice president of instruction and student services at Los Medanos Community College in Pittsburg, Calif. At Los Medanos, Horan led the efforts to increase student success with an emphasis on inclusion and collaboration between faculty and students. He also led the planning and implementation of a more than $125 million-dollar bond to improve on-campus facilities at the college, including a new kinesiology and athletics center, and a new student union. Jan. 7 marked Horan’s first day on the job following his November 2018 appointment by the SBCCD Board of Trustees.